it all begins with our puppy training. 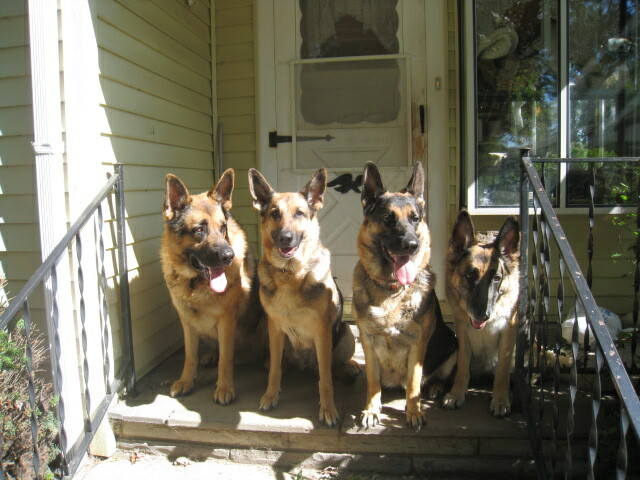 German Shepherds are naturally good protectors. They love their "pack" or "family", and will generally always protect them. Many times they will patrol throughout the night, going from one room to another to check and monitor. They will naturally place themselves between their family and a potential threat. 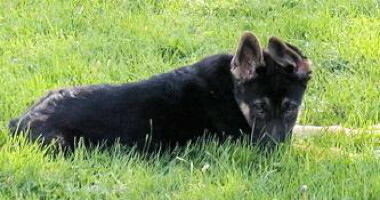 I have heard many stories about how german shepherds have alerted and protected their owners without any formal training. One dog in particular noticed an intruder at the neighbor's house across the street. He would not settle down and kept doing this low growl and looking out the window to the neighbor's home. sure enough, there was a man wandering around that house. The police were called and the intruder was arrested for trying to break into the home. Our puppies are raised inside with lots to tender loving care. They are introduced to different things so they will be well-adjusted puppies when it is time for them to go to their new homes. They are handled daily from day 1. 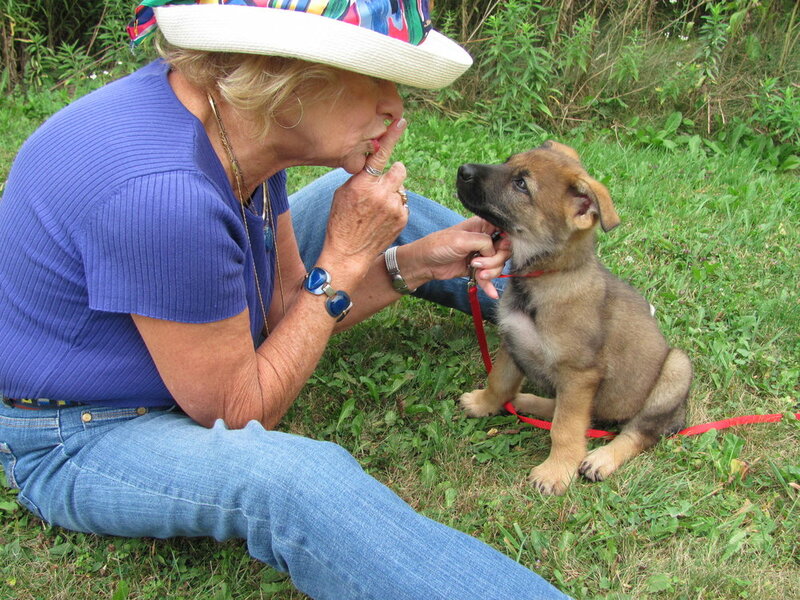 They are introduced to children and the bigger dogs as well. We also have two cats that take their job seriously to help socialize the puppies. We have had several dogs earn their CGC (Canine Good Citizen) award. Schatzi and Ryken are trained Search and Rescue dogs. They are in the Pittsburgh area. They have been called out to find several people including a couple of alzheimer patients and also a young child. They were successful in all. We are very very proud of them and their owners for their diligent work and endless hours of training. We have taken some of our dogs and older pups into a couple local nursing homes to cheer the residents. The dogs were very well behaved, and did a wonderful job cheering the residents. They brought many smiles. They dogs especially loved the popcorn, that they occasionally received. We have also taken a couple of our adult dogs into a local day care facility and the kids and dogs loved that also. We won't send you home without a good start! 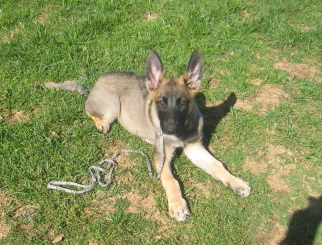 Our puppies are started on house-training, starting at about 4 to 5 weeks of age. We have an area set up in their whelping boxes with wood chips and they start using the wood chips to eliminate on their own about 4 to 5 weeks of age. We also have a place set up for when they spend time outside and they go to the wood chips to "do their business". They are also used to being fed on a schedule to help the potty-training process. They are not house-trained, but the idea is to make this one step closer for them and their new owners. This isn't fool-proof, but we have had great feed-back from our clients. We introduce them to as many things as we can, so they won't be fearful of other people and noises etc., as in running the vaccum cleaner, and having the tv on, and just going about daily routines etc. They will also experience a ride in the car usually going to the vet office for their check-up. Most of them do very well with all of this. Our vet is about an hour away, so, it's usually a three hour trip for them. 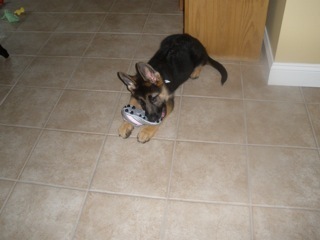 Training starts early, pups need to learn what and when it is appropriate to chew. - turn your back and baby's shoe becomes a snack! This pup learned "sit, stay" and "down, stay". Hard work makes great results. 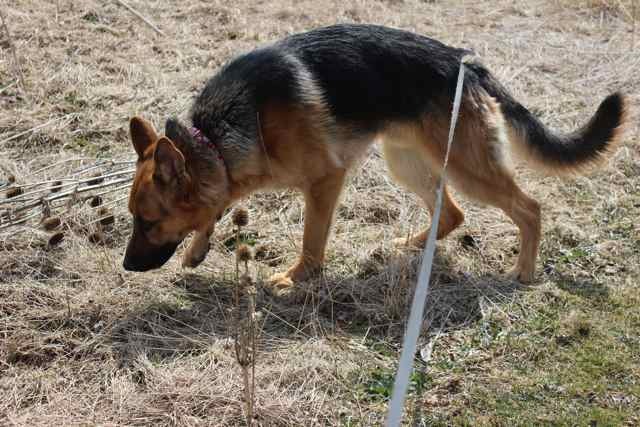 Patience and diligence are key components to training your puppy. 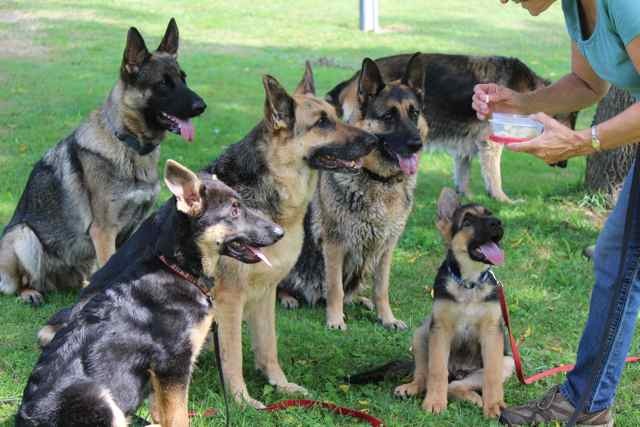 German Shepherds are very eager to please and love to learn new things. They are always eager to please their owners. Group training is always fun too, and will come later after your puppy learns the basic commands first. We always encourage people to go through some obedience training courses with their puppies and dogs. This helps with socialization as much as training. And you get to meet some wonderful people. Request our Newsletter - COMING SOON! We are excited to bring you our newsletter! Very soon on this page you will be able to sign up for our monthly newsletter! Every month you will be the first to know what is going on at Shadowbrook Shepherds, you'll be first to see when new litters are being announced. You will also see what we are proud of before everyone else does, right in your email. This will be a great way to stay in touch with your Shadowbrook Shepherds family!